Three local elected officials appeared last night at a meeting of the Prospect Heights Neighborhood Development Council (PHNDC), and the Atlantic Yards news came not from City Council Member Letitia James (speaking at left), who barely mentioned the project, noting that her position was well-known. 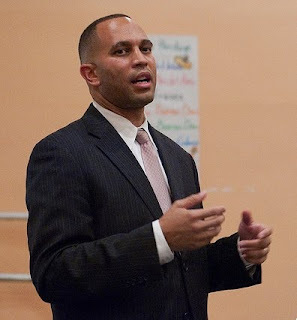 Rather, Assemblyman Hakeem Jeffries and state Senator Eric Adams, two elected officials somewhat critical of AY but--unlike James--have not stood with project opponents in protests and lawsuits, offered some clarification of their positions. Notably, Jeffries said he and other local elected officials seek a meeting with the state's leaders to discuss Atlantic Yards; that he didn't have editorial control of a seemingly pro-AY letter he signed; that the federal Department of Homeland Security, not just the New York Police Department, should advise on security issues; and that the Empire State Development Corporation (ESDC) had not empowered its own AY ombudsman to do the job. Adams added that the history of a failed terrorist attack at the Atlantic Avenue terminal made a careful security review imperative, which means he can't endorse the project at this time. 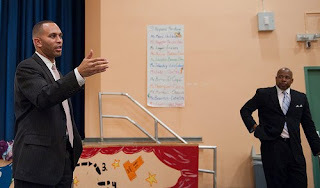 The lightly-attended meeting, which drew about 40 people at peak to PS 9 on Underhill Avenue in Prospect Heights, covered various other concerns raised by residents, as well as gave the officials a chance to mention their own priorities, including upcoming events, improving local security, and legislative approval of gay marriage. Jeffries said that he and other local lawmakers have asked for a meeting with either Governor David Paterson, Lieutenant Governor Richard Ravitch, or the governor's secretary, plus the new heads of the Metropolitan Transportation Authority (MTA) and ESDC, for an "accounting of where we are at with respect to the Atlantic Yards project." He cited a "widespread insensitivity" on the part of those in charge of the project to the concerns of the elected officials and the community, "and the fact that, many of us, I believe, think the project has gone in the wrong direction." He said that, rather than have a flawed project improve, "it's gotten worse." 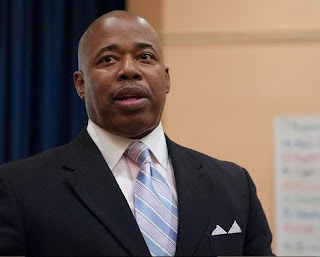 The last time elected officials could engage agency heads was on May 29, at the state Senate oversight hearing, he noted, but both the ESDC and MTA have new leaders since then. Given the "precarious situation" of an election year, Jeffries said he hoped that Paterson would be sensitive to the concerns of local officials. Atlantic Yards opponent and Community Board 8 member Robert Puca asked Jeffries why, if he wasn't a supporter of the project, he co-signed a letter that declared that Atlantic Yard s "a major economic development venture that is vital to the economy and the future of Brooklyn." Jeffries, who after facing criticism clarified his distance from the letter, in his response reminded people why he is a very accomplished lawyer. "First, with respect to the letter," he said, "as I've indicated, my colleagues, John Sampson and Nick Perry, asked me... to participate in a meeting with the new investor as it relates to the Atlantic Yards project. And I said, Of course, I'll participate in that meeting. I meet with people I agree or disagree with all the time..."
"I reviewed the letter, in passing, didn't have editorial control of the letter as it was ultimately sent," he continued. "Now, you may quibble with a few of the words that are used in the letter, but I think my position has been clear." Actually, Jeffries' position has been somewhat fuzzy, which is why he was later asked to clarify it, which he did, as noted below. "Had I had editorial control of the letter, maybe I would've changed one or two things," he said. "But I don't think that suggesting that it's vital is necessarily an egregious statement because it doesn't say its success is vital." Also, as noted on the video, Jeffries was asked about the pending bill that would reform public authorities. He said the most important aspect of the bill, which Paterson--under pressure from Mayor Mike Bloomberg--still has not signed, is to codify the fiduciary duty of board members to act in the best interest of the public. As for the Metropolitan Transportation Authority's willingness to renegotiate the Vanderbilt Yard deal with Forest City Ratner, he said, "allowing the developer to walk away from $80 million"--the payments that would be attenuated, if paid, for the resit of the railyard--"was a breach of their fiduciary responsibility... regardless of whether the law was passed or not." Still, he noted that the bill, even if signed, wouldn't have an impact on Atlantic Yards, because it's prospective, not retrospective. Unmentioned was that Jeffries, despite his criticism of the MTA, chose not to join James and three other legislators, in a lawsuit challenging the deal. In response to a question from Develop Don't Destroy Brooklyn spokesman Daniel Goldstein, Jeffries said he's stressed to governor's office the urgency of having a meeting soon, given that issues regarding Atlantic Yards likely would be resolved in the next few months. While agency heads come and go, the governor is in charge, and that Paterson or Ravitch should pay attention, he said: "I do believe that, ultimately... the governor can change course at any point." As for eminent domain, he said, "They have said they can't talk about it 'til the litigation is complete. But if things don't go the way the plaintiffs have argued, that's something that we can revisit with the governor." Jeffries has long said he opposes eminent for a basketball arena, but has not specifically supported the past and pending eminent domain case. Adams, a retired Captain in the New York Police Department, focused on security issues, as he has in the past. Leading off, he said, "The thought of building a bridge over Atlantic Avenue is a major issue"--a befuddling statement, because there's no plan to build such a bridge. He cited, as others have, a "major [past] terrorist attempt at the Atlantic Avenue station.... To build a structure there of that magnitude and capacity--that bumps us up on the terrorist level." "Until we come up with very realistic... security measures and infrastructure," he continued, "I do not think it was well thought-out and I cannot endorse the project, with the way I feel at this time." Goldstein followed up, asking if security was a real issue. Goldstein asked what should be done. Adams noted that, while he chairs the Senate's committee on homeland security, it doesn't have veto power over the project. Goldstein continued: "It's an issue that's never been properly replied to... it's actually been sort of laughed at." Adams said "we have to push for" a proper airing of the issue. He said he'd bumped into the head of the MTA and said they should talk about it, and how a "real plan" was needed to deal with the threat. Has the federal Department of Homeland Security weighed in? No more than a letter. Jeffries added that Adams, given his past career, was in a position to look at the issue. He also said it would make sense to community with Rep. Yvette Clarke, who represents the area, who also sits on the House Homeland Security Committee and could ask federal agencies to ask for a formal threat assessment. "If we're just going to rely on [Police Commissioner] Ray Kelly and the NYPD, which is going to take orders from Michael Bloomberg," Jeffries said, "it is not going to be a legitimate review." So, he said, "the federal option is the most viable." Project opponent Steve Soblick asked Jeffries, "What do you believe needs to happen going forward?" Jeffries cited three issues. First, he said that "the extraordinary power of eminent domain... should be used in very limited circumstances," but not "to benefit a private developer, particularly when it relates to the construction of a basketball arena that is not going to generate a positive income for the city or the state, as the Independent Budget Office revealed." "Depending on what the court rules, we'll have to engage the governor and the ESDC, and forcefully express our opinion on that issue. If they don't have the power to use eminent domain, there is no arena," he said. "I'd be happy if my good friend [Mayor] Cory Booker in Newark gets his Nets, like he wants. And we could go on with our lives, and try to get some affordable housing built at the site." "It's clear that... affordable housing is the unifying aspect of whatever needs to happen at Vanderbilt Yards," he said. "It's something that's desperately needed... It will also create jobs, so some of the construction trades, that are concerned about the jobs that could be lost if there is no arena--there's still a whole lot of jobs that are waiting to happen if you have significant affordable housing constructed at that side." "And we have to firm up those commitments, because, instead of strengthening those commitments over time, the commitments have been weakened over time," he said. "It's something we're going to have to communicate to the governor as well as the ESDC." However, final leases and other documentation are currently being negotiated by the ESDC, without input from Jeffries and other officials. And the ESDC has never answered questions about how the cost per unit of the planned housing compares to subsidized housing elsewhere. "The third issue," Jeffries said, "...if in fact something is going to move forward in whatever form that takes, arena, commercial, residential housing... it's going to have a real impact on the quality of life of the community, as it relates to overburdening the infrastructure, social service delivery, as well as quality of life day-to-day construction concerns." The latter statement was a nod to a public comment that work on the railyard was going on late into the night, disruptive to neighbors. "So we have to have an agency, it should be ESDC, that... coordinates the responsiveness of all the other agencies... the Department of Buildings, Sanitation, MTA," he said, "because the ombudsman system... created by the ESDC is was nonfunctional. I think it is nonfunctional because the higher-ups at ESDC aren't interested in empowering the ombudsman [Forrest Taylor] in a manner that would benefit the community."